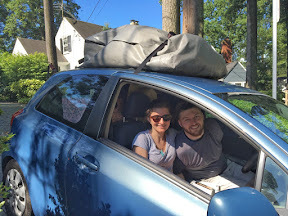 On Tuesday, July 5, Josh and I left Bethesda a little after 10am. I had an emotional goodbye with my parents and felt really surreal leaving home. It didn't feel like it would be months until we're back there again. The first two days of driving were our longest of the entire trip. We wanted to get South and West as quickly as possible so we were prepared to just power through to Austin. As soon as we got on the road, we realized that all our music was in the cloud so we had to go 14 hours without. We listened to a lot of podcasts, talked on and off and cried randomly (that was just me). Driving through Tennessee, though it is a freaking long state, was beautiful with mountains and hills and green trees. 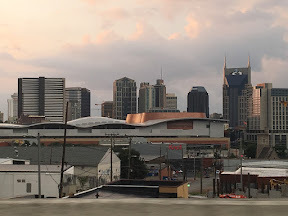 We also drove through a post-storm sunset in Nashville and for the hour or so beyond in the mountains. After a long day that went by pretty quickly, we arrived in Memphis where we stayed in a hotel by the airport. We slept about six hours and got back on the road to keep traveling. 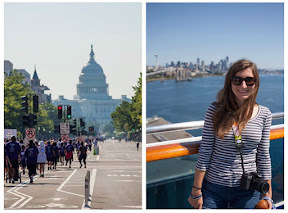 In the morning, we drove through downtown Memphis, along the Mississippi River and stopped at a market to pick up breakfast and lunch before leaving town. Then we crossed the mighty Mississippi feeling like we were leaving the East Coast so abruptly. 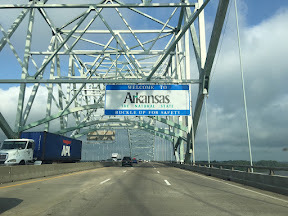 We entered Arkansas, the so-called Natural State and both our first new state on the trip. We pretty much powered through, seeing Little Rock from the car, seeing signs for Bill Clinton's childhood home and stopping only for food and coffee. I started driving toward the end of Arkansas and reached a coffee high right around the time we reached Texarkana and entered Texas. At this point, we were at the height of our very important discussion about what hashtag to use for our road trip. Using a shared hashtag was another thing that friends encouraged us to do but everything that I or my friends suggested was too lame for Josh. On my coffee high, I came up with: #bestcoastbassetts, #carrieandjoshforeverwest, #settledinafinerlocation (in reference to RHCP Californication, which I learned actually says "Settled in a final location") and then we thought we could move to Texas instead so we could use #carrieandjoshtexasforever. We settled on #bassettsroadtriphashtag, the most obvious one after two days of on and off discussion. 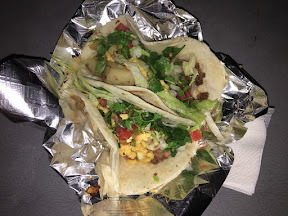 We drove and drove, trees turned to open spaces, we saw Dallas from afar, and then a little before 6pm, we arrived in Round Rock, a suburb of Austin. We would be spending the next two nights with Brian, one of Josh's best friends from college, his wife Amy and their three month old twin girls. When we got there, Amy was home with the girls who we got to meet, hold and marvel at. It is really weird and cool when your friends have babies and it is fun to meet them. After Brian got home, we all hung out some and then the three of us drove into Austin for dinner and a drink. 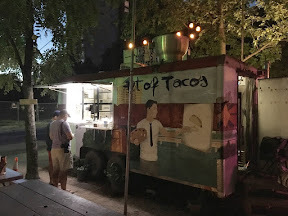 We ate tacos at "Art of Taco" which were fine but not the best. Brian asked how we were feeling about everything and we acknowledged how surreal it all felt. Then we went to Banger's Sausage House and Beer Garden for a beer. We sat at picnic tables drinking our beers with sweat dripping down my legs at 10:30pm (it's hot in Austin) and laughing about old college memories. When we got home and crawled into bed, I was so relieved to be staying in one place the following day. We had traveled over 1,500 miles in two days and were ready for the first day of fun on our trip. On October 4th, Ingrid and I ran our first trail race. 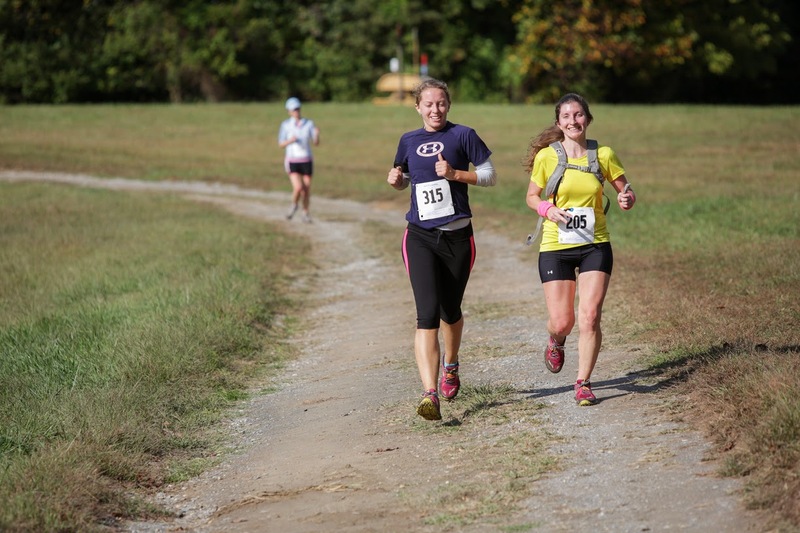 It was the Zooma Women's Dirty Damsel 10k at Rosaryville State Park in Upper Marlboro, MD. We signed up for this race just about a month ago, after each of us had been on only a handful of trail runs in our lives. We figured it best to set a goal and have something to work towards. So we registered, dropped big bucks on new trail running shoes and created a short "training plan". We ran trails together every weekend and track during the week to keep in shape. After 4 weeks of training, it was time to race! This race was all women and was much smaller than a road race, as I'm sure any trail race is. We ran on dirt roads at the beginning and end but spent at least the middle 5 miles on single-track through the woods. We learned that it can be hard to get a rhythm at first because people are still figuring out their speed and it can take some time, or be awkward, to pass people. I went into this race thinking we were taking it easy - as Ingrid was getting a cold and I had had stomach issues the week before. But Ingrid's "easy" turned out to be hard for me. I was pushing to keep up with her for the majority of the race, especially on the longer hills. I really learned how different trail running is from road running. It's so much more about muscle size and strength. And that girl has bigger and stronger leg muscles than I do... damn her. We sprinted to the end, crossing the finish line at the same time. After grabbing some food and lounging in the grass, we checked the scores to find that we'd tied for third place in our age group, finishing in 1:01:11. I was pleased with this time, given that one of the first things I had to drill in my head about trail running is that you can't compare your times to your times on the road. We left feeling high and ready for more. Bring on the trails! I have often considered taking up trail running but I've been scared of wandering the woods alone in DC. I get paranoid. My best friend Ingrid started running trails with her boyfriend and telling me how awesome it was. So over labor day weekend, I set out in the middle of the afternoon to explore some trails near me in Rock Creek Park. The verdict: trail running is awesome! It's the running version of hiking. 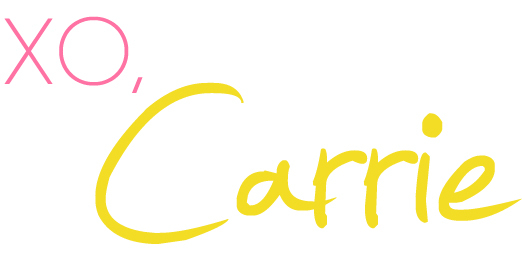 It is constantly exciting and varied. 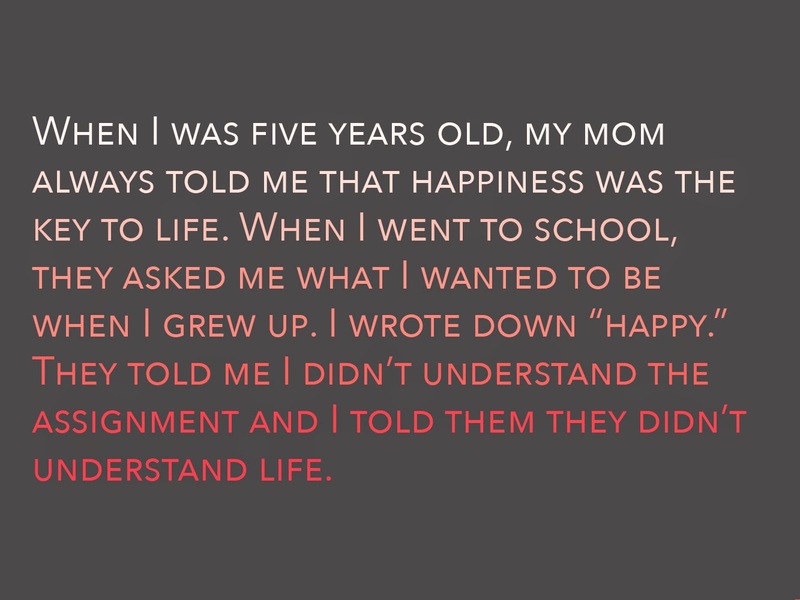 It is also really hard. It requires serious leg muscle strength, aerobic capacity and good concentration. It is easier on the joints, as long as you're careful with your ankles, and it seems to use more muscles than road running. It makes you feel like a Tarzan. I am still a little uneasy about running alone in the woods. But I've realized that much of Rock Creek is well traveled by many other runners and hikers, especially on weekend days. And I have plans to trail run and train with Ingrid. I'm excited about this new hobby and I'm hoping to keep up with it. It is so awesome to spend time in the woods, in the middle of the city, and I hope that a thirst for trails pushes me to pursue new adventures and explore new places. Up until a few years ago, I didn't know a thing about chia seeds. Then I read born to run and have never forgotten the author's theory that "if you're stranded on a dessert island and can only bring one thing with you, you should bring chia seeds because, eventually, they'll make you strong enough to swim home". Chia seeds are a so-called super food that are rich with omega 3 fatty acids, protein, carbohydrates, fiber, antioxidants and calcium. I have bought into this for several years and eat chia seeds almost every day - usually sprinkled on my breakfast but I can not report any noticeable effect, good or bad, of the little seeds. Last week, I took it a step further and tried a simple chia pudding for breakfast. I combined chia seeds with vanilla almond milk and let it sit overnight in the refrigerator. In the morning, I added dates and almond slices. 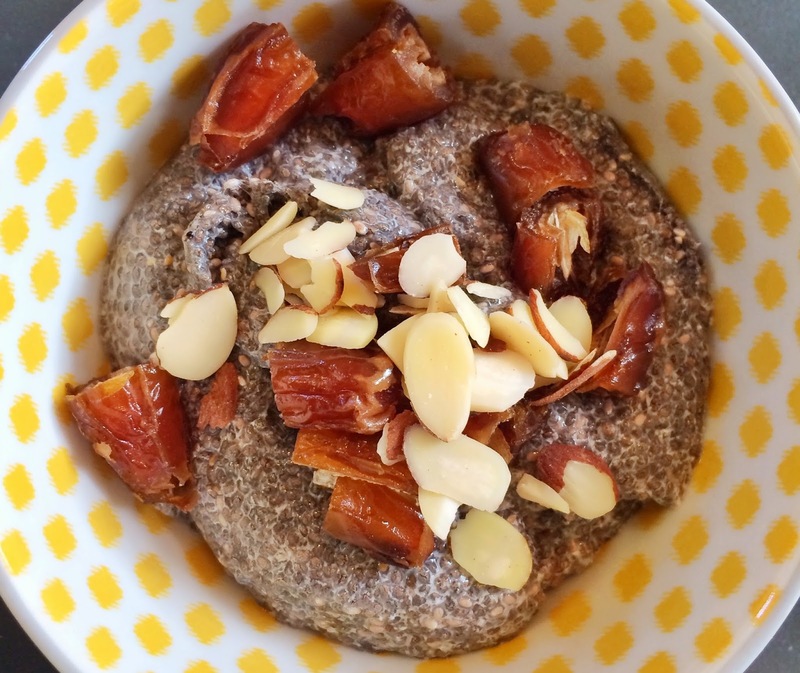 This was a good, simple recipe for a basic chia pudding breakfast. I am going to continue experimenting by adding oats, yogurt or other berries. Combine chia seeds and almond milk in a bowl and stir. Cover and store overnight in the fridge. in the morning, sprinkle with dried fruit and nuts and drizzle with honey. Enjoy!